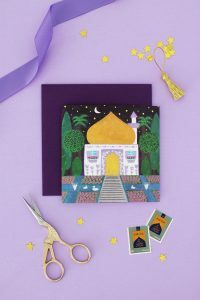 Eid Pipe Cleaner Gift Toppers – Hello Holy Days! Exchanging gifts for Eid? Dress them up with the symbol of Islam: a crescent moon and star. These pipe cleaner gift toppers are an easy craft – even kids can make them (but be sure they watch out for the sharp edges of the pipe cleaner.) For a touch of sparkle, use tinsel pipe cleaners in addition to chenille ones. Bend one pipe cleaner into a C and shape it into a crescent moon, leaving about an inch of pipe cleaner at the top. Shape a star out of the second pipe cleaner, leaving about 6 inches of pipe cleaner at the top. To make an evenly shaped star, take about 1/2″ of pipecleaner, and accordion fold along the pipecleaner 4 times, these will become the points of the star. Join the two ends to make the 5th point. Use the pipe cleaner left at the top of the moon to secure the star to the moon. When adding ribbon to your wrapped gift, tie one knot. Then secure gift topper to the ribbon by using the pipe cleaner left at the top of the star. Finally, tie the ribbon into a bow. TIP: To help kids in forming the shapes, draw out a crescent moon and star on a piece of paper and have them use it as a guide for bending the pipe cleaners.